It was a dark and rainy night… Delirious from the state of things in the something, I needed respite. Luckily I knew I had it. I grabbed my guitar, sang a few notes, and bolted out of the door. After standing up and dusting myself off from the fall I took, I got in my car. Driving to Boulder, I kept manually washing the rain away, pushing down on the windshield wiper. After about 100 times doing this, I realized it would be easier to set the windshield wiper to automatic. After a 20 minute drive, longing the entire way for some form of connection, I arrived at my destination. Walking in from the rain, I could sense excitement, I could sense open minds, I could sense an open mic. There is an exciting new performance opportunity in Boulder, giving YOU the chance to let your talents SHINE. The Open Wire, at Shine Restaurant & Gathering Place is a welcoming community of talented artists, excited to share and foster their creative spirit. Paul Kimbiris, local singer-songwriter who has an eloquent and soothing style, is the host of Open Wire. A fitting position for someone so obviously dedicated to being a singer-songwriter, the art form where poetry and music intersect and enmesh. On the night I was there, Paul had the sign up sheet ready to go at 8:30. Each performer gets about 10 minutes to do their thing. For the short time it has run since September, it has been a mixture of poetry and music. I happened to perform this evening, going on after Paul opened the night with a lively original. It was my first time singing in public, so I was very nervous (they say that you should tell yourself that you’re excited). The warm introduction that I received from Paul instantly put my nerves at ease. The tech and set up was very smooth too, so I wasn’t disoriented from having to struggle with technical difficulties. This made the performance go much smoother. I appreciated the fact that Paul introduced each performer with the same energy and respect. He acknowledged that it is a tough act getting in front of strangers and pouring your heart out. When each performer was done, he made sure they got their due applause. Everyone that was their that night deserved it too, I was delighted with the artists that came out to share. The night was dominated by music and topped off with some poetry by Brandon Antony accompanied by Paul Kimbiris on improv guitar. A lovely way to end the evening, a fitting way to head back out into the rain with something to contemplate in your brain. What were your intentions behind starting Open Wire? Open Wire is the culmination of our long awaited plan to start an open mic in Boulder. Part of ALOC’s mission is to cultivate a community of artists who engage each other through collaborative events. We decided the open mic model will provide opportunities for Boulder’s up-and-coming musicians and poets to practice their delivery in public. It’s important for these creatives to have a place where they feel comfortable and are encouraged to share. The beginning is always the most important time to build that necessary level of confidence. Are you open to the more experimental crowd, or do you like to keep it more traditional? Or I suppose a more appropriate question is, who is welcome at the open wire? Who are you looking for? There is a balance of striking the aesthetic that fits the “Restaurant” part of “Shine Restaurant & Gathering Place” while still being open to the styles of art that go against the traditional grain of an open mic event. We encourage anyone who appreciates auditory expression to come enjoy the performers and, even more important, to share when the time feels right. The collective thought process seems to be that we take it a week at a time. So far the orientation has been mostly with singer- songwriters and poets. Are your plans to stay in the same spot, or do you plan on switching between the back and front of the house? As it stands, ALOC is just getting the ball rolling with Shine, and we feel good about it. For now the plan is to remain at the front of the house. 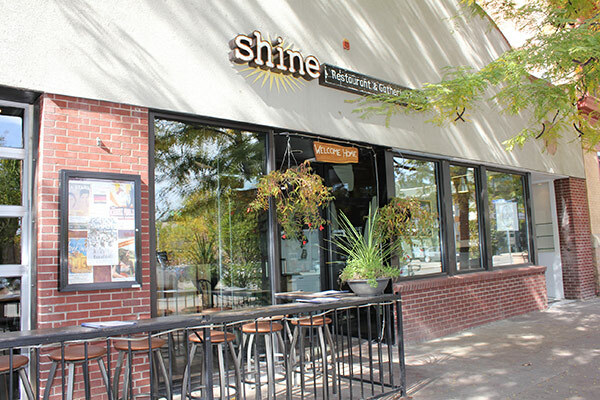 The Gathering Space for Shine is affixed with the intention to remain available for those interested in utilizing the area for events beyond the scope of Shine Restaurant’s direct management. We are wanting to continue to develop even more events within our arts community, in a variety of venues, in addition to Open Wire at Shine. How long do you envision Open Wire going? Ideally, Open Wire is the start of a long-term event, but as the current arrangement stands, we have until the end of the year to encourage participation and build a crowd before we can discuss lengthening the timeframe. With your help sharing this article, through word of mouth and social media, there is ample time to show Shine that Open Wire is a worth-while endeavor. Is Paul the permanent host for the time being? Why Paul? Paul Kimbiris has been woven into the Boulder singer-songwriter scene through his years of music networking, personal projects and live performances. He has a great connection with many artist akin to his genre, while carrying a unique and heart-felt sound. Paul also happens to bartend at Shine and has a healthy history of working with ALOC in promotions, collaborations and photography. We decided on Paul not only for his prowess as a singer-songwriter but also for his unique charisma. His humor is of an engaging caliber that we believe the attendees of Open Wire will come to know and love just like we do. He is the permanent host for the time being. Open Wire is on the first and third Thursday of every month at Shine Restaurant & Gathering Place. Sign up is at 8:30pm, but if you just want to listen, the event itself starts at 9:00pm. Come see local talents shine their lights bright! Alexander White is a multifaceted artist based in Boulder, CO who combines the disciplines of art, music, and poetry to convey his vision and to inspire positive action. His most recent performances have been community centered, ranging from punk jazz nights, to local painting projects, to poetry gatherings. He is motivated and inspired by the outsiders. He seeks to give a voice to those who struggle to have theirs heard. Previous Submissions for LoveShovelReview camp edition due TOMORROW!! Next The Howloween Boulder Writers Warehouse Fundraiser Party by Urwill Rocks!